Clinical, biological and neurobiological studies have shown that the first three years of illness provide a critical window for early effective intervention in eating disorders. For anorexia nervosa in particular, illness duration is a key predictor of treatment outcomes. 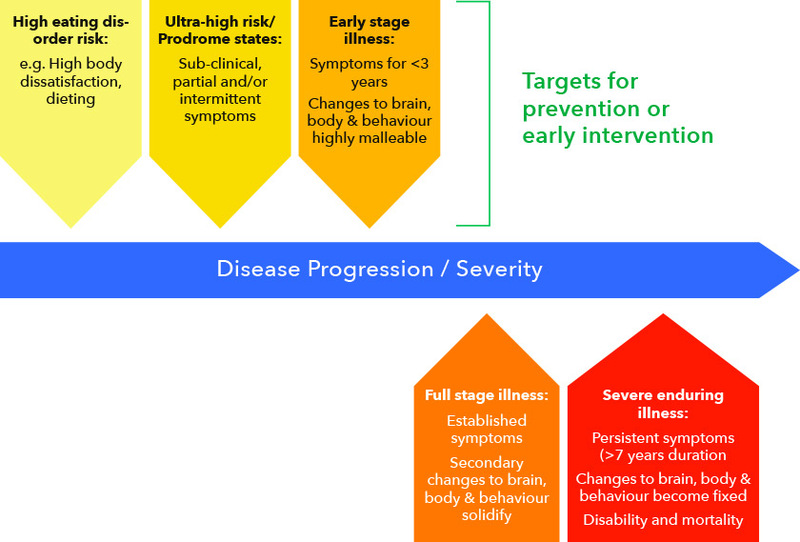 Outcomes are best with duration of illness < 3 years. Growing evidence suggests that eating disorders are associated with significant structural and functional brain changes. Eating disorder behaviours are initially rewarding, then habitual, and then neurocognitively engrained. Because eating disorders typically develop in adolescence and young adulthood, when the brain is still developing, these brain changes have potential to disrupt brain maturation. Eating disorders tend to persist over time. The longer a young person is unwell, the more likely it is that brain changes will occur and persist. In addition, they are more likely to experience disruptions to social, educational and emotional development. Early intervention is consistent with a stage of model illness, for which there is considerable support for anorexia nervosa in particular and all eating disorders to some degree. Patient and family-related barriers (e.g., not realizing there is a problem, not wanting to change, being skeptical of health care services). Primary-care based barriers (e.g., lack of GP awareness, knowledge or skills, or uncertainty about how to refer to specialist treatment). Service-related barriers (poor access to services, waiting times within services, and poor transitions between services). Recent data from Germany and the UK report an average duration of DUED of between 25 to 41 months for first episode eating disorder cases. This suggests that many people only access treatment after the critical window of the first 3 illness years. FREED aims to address each set of barriers but was developed to overcome service-related barriers in particular. Currin L, Schmidt U (2005). A critical analysis of the utility of an early intervention approach in the eating disorders. Journal of Mental Health, 14, 611‐624. Keverne EB (2004). Understanding well‐being in the evolutionary context of brain development. Philosophical Transactions ‐Royal Society of London Series B Biological Sciences, 359, 1349‐1358. O’Hara CB, Campbell IC, Schmidt U (2015). A reward-centred model of anorexia nervosa: a focussed narrative review of the neurological and psychophysiological literature. Neuroscience Biobehavioural Reviews, 52, 131-152. Seitz J, Herpertz‐Dahlmann B, Konrad K (2016). Brain morphological changes in adolescent and adult patients with anorexia nervosa. Journal of Neural Transmission, 123, 949‐959. Schmidt U, Brown A, McClelland J, Glennon D, Mountford VA (2016). An idea worth researching: Will a comprehensive, person-centered, team-based early intervention approach to first episode illness improve outcomes in eating disorders? International Journal of Eating Disorders, 49, 374-377. Steinhausen H‐C (2002). The outcome of anorexia nervosa in the 20th century. American Journal of Psychiatry, 159, 1284-1293. Treasure J, Stein D, Maguire S (2015). Has the time come for a staging model to map the course of eating disorders from high risk to severe enduring illness? An examination of the evidence. Early Intervention in Psychiatry, 9, 173-184. Van den Eynde F, Suda M, Broadbent H, et al (2012). Structural magnetic resonance imaging in eating disorders: a systematic review of voxel‐based morphometry studies. European Eating Disorder Review, 20, 94‐105. Most eating disorders will develop in adolescence or emerging adulthood. Eating disorders can heighten a sense of instability, an uncertain identity and feeling ‘in between’. Emerging adults with eating disorders may need help navigating major transitions in their lives (e.g., in education, work, living circumstances, relationships) and to form an identity and adult life separate to their eating disorder. FREED was developed with emerging adults in mind. We are continuing to research the defining features and needs of this particular group. The waiting time from referral to assessment reduced by 32% (mean days = 42 FREED vs. 62 Audit). The waiting time assessment to treatment reduced by 41% (mean days = 20 FREED vs. 34 Audit). 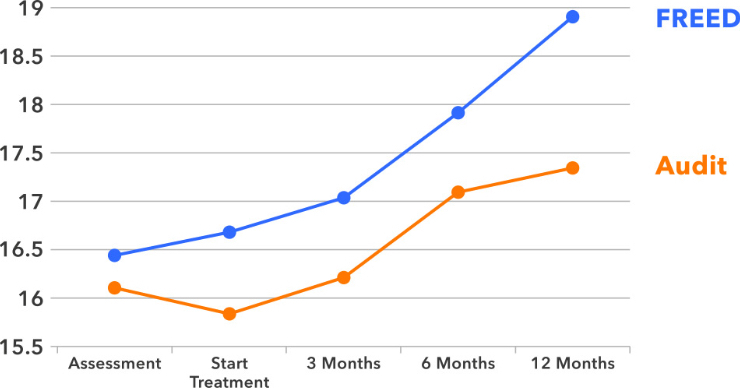 Duration of an Untreated Eating Disorder (DUED) reduced from 19 months in the Audit sample to 13 months for FREED patients with immediate funding for treatment (16 months for those where funding was delayed). 100% of FREED patients commenced treatment after assessment, compared to 73% of Audit patients. FREED patients and Audit patients attended a comparable number of treatment sessions (median = 21 for FREED vs. 18 for Audit) and the treatment completion rate was 71% for both groups. 9% of FREED patients compared to 14% of Audit patients required day patient or inpatient care in addition to outpatient therapy. 70% of FREED patients had eating disorder symptom scores below clinical cut-points by 12 months. 59% of FREED patients with anorexia nervosa reached a healthy weight by 12 months, compared to 17% of the Audit group (see Figure 1). Introducing FREED did not result in non-FREED patients waiting longer for treatment. Figure 1. Body Mass Index (BMI) trajectories from assessment to 12-months after starting treatment, for patients with anorexia nervosa treated through FREED compared to a matched Audit control sample. After the initial evaluation, FREED scaled to three new eating disorder services in the UK: Central and North West London NHS Foundation Trust, Leeds and York Partnership NHS Foundation Trust, and North East London NHS Foundation Trust. This project is called FREED-Up and has run from 2016 to 2018, again with support from The Health Foundation. Over 250 patients have taken part. Data from FREED-Up are still being collected, but so far they support the effectiveness of FREED in diverse treatment settings. Full outcomes will be available in late 2019. Feedback from patients, clinicians and services has been very positive. From 2018 on, the effectiveness of FREED will be evaluated using ‘real world’ clinical data rather than through a research trial. Brown A, McClelland J, Boysen E, Mountford V, Glennon D, Schmidt U (2016). The FREED Project (first episode and rapid early intervention in eating disorders): service model, feasibility and acceptability. Early Intervention in Psychiatry, 12, 250-257. McClelland J, Hodsoll J, Brown A, Lang K, Boysen E, Flynn M, Mountford VA, Glennon D, Schmidt U (2018). A pilot evaluation of a novel First Episode and Rapid Early Intervention service for Eating Disorders (FREED). European Eating Disorders Review, 26, 129-140. FREED is designed to give young people rapid access to specialised evidence-based treatment and support tailored to their needs. The FREED Network consists of all services using FREED, with access to evidence-based protocols and patient resources to support early intervention in eating disorders. Access helpful guides for GPs and other health professionals (no registration required) or register for our online training platform if you are interested in using FREED in your service.